Yes! Snow Day! 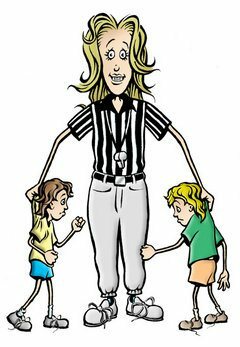 Another day of sibling squabbles refereed by Mom. Another day of screaming, whining, pushing, shoving, “don’t,” “that’s mine,” “no!”…ah, yes, a SNOW DAY! Thanks, Super Nintendo Chalmers. Thanks a lot. My coffee tasted amazing this morning. I don’t know why and I know no one cares, but it did. I’m still thinking about it and it’s nearly 11pm. My tiny baby is 10 months old today. He’s a beast. Big fella. So adorable. So happy. I’m pretty sure he’s my last baby (why mess with perfection? ), and it’s sad watching him become less tiny. I fricken love that kid. He’s so awesome. Any day spent with him is worth celebrating. Zumba. Monday night is Zumba night. 8pm. Right about the time when bedtime stall is in full effect. Mommy’s out the freaking door! Adios, muchachos! And it’s glorious. I shake it like I own it. I look like a fool, I am sure. But I feel cool for 30 seconds at a time maybe 10 times throughout the hour. That’s 300 seconds of hot Zumba brilliance every Monday night. Work tomorrow. Yes! I love Tuesdays. I love being able to stay home with my kiddos just long enough to be ready to go back to work. I love work, I love home (except on Mondays), but I’m pretty sure I’d love Mondays a lot less if they were spent in the office. And those sweet tiny faces I just checked on all snug in their beds – they aren’t so bad. They’re pretty darn cute, especially when they’re sleeping. 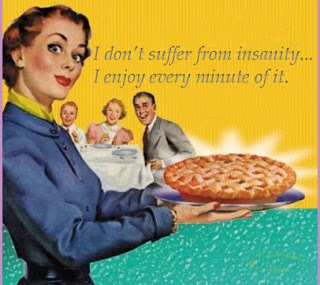 I don’t suffer from insanity… I enjoy every minute of it! Being the mom of a 9-month-old, 3-year-old, and 6-year-old has its perks. For example, I never get lonely, I never run out of things to do, and I fall asleep as soon as my head hits the pillow. It is in fact possible for a 6-year-old to go to the bathroom 12 times after being put to bed. And something liquid comes out every time. This kid is part canine, I am sure of it. If you fart while you’re changing your baby’s diaper you can totally blame the stink on him. Genius, I know. Toddler tantrums are best diffused with humor rather than anger. Nothing, I mean NOTHING smells worse than 6-year-old morning breath. …OK, maybe 6-year-old buns after a day of wiping himself are worse. My boys are 3 and 6 and they never stop whining, fighting, pestering, touching each other. Ever. No matter what. YAY for siblings!!! 3 days a week. Don’t know where I’d be without that place. I should be awarded a gold medal for changing a messy poopy diaper with just one wipe. BAM! I totally owned that dirty diaper. Babies are awesome. I wish they could stay small and cuddly forever. And not talk……talk back, that’s what I meant. For Christmas, my mom gave me this cool new book. It’s called Q&A a Day For Kids. 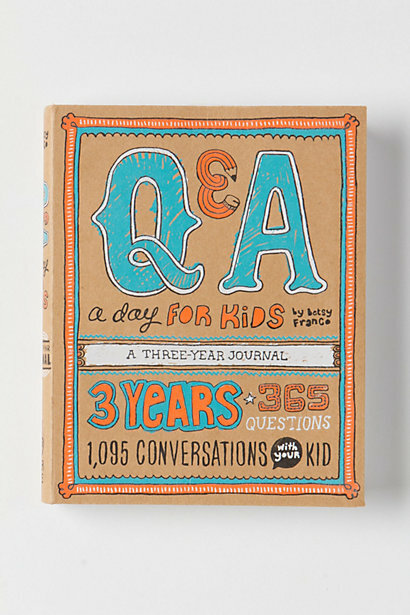 The jist of it is that every day you ask your kids a question and record their answer in the book. It includes space to record their answers for 3 consecutive years. So, for example, on January 8th I asked Joseph and Alex a question. Then on January 8th, 2014 and 2015 I ask them the same question and record their answers. Pretty sweet, huh? Always ask Alex the question first. Otherwise Joseph and Alex’s answers will be the exact same. Getting Joseph to pipe down while Alex works through his answer is nearly impossible. Seeing how their little brains comprehend questions that even I find tough to answer is amazing. This book would probably be better for kids over the age of 4. But we’re going to go with it for Alex anyway. Spending some time at the dinner table talking about things other than how many more bites we have to take is exhilarating! It’s fun to see a theme to their answers. It’s also fun to see how evident their personalities are in their answers, even at 3-and-a-half and almost 6. Q: If you could take a trip anywhere in the world, where would you go? I can’t wait to see how their minds, outlooks, and responses change over the next 3 years. Thanks, Mom, for this awesome tool to document what might otherwise go unsaid and unexplored.